After O'Neill peers inside an ancient viewer on P3R-272, he begins speaking an alien language and using concepts of complex science and mathematics. 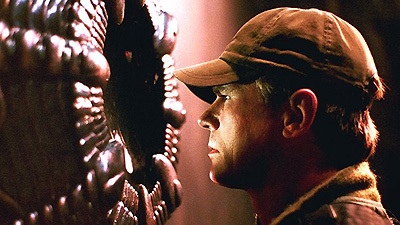 Daniel is convinced that the alien device contained the knowledge of the Ancients, the builders of the stargates, which it downloaded into O'Neill's brain. Unable to control the changes that are happening to him, O'Neill's subconscious leads him to build a peculiar device which powers the stargate to a far distant destination where he can seek help. There he meets the Asgard, who speak of the four great races, and of Earth - the fifth race. "Ernest's Planet", the meeting place of four distinct races (referred to as P3X-972 in Torment of Tantalus) is reclassified as PB2-908. The inscription in a circle found on P3R-272 matches one of the four language inscriptions from PB2-908, belonging to the Ancients. The device on P3R-272 is the archive of the knowledge of the Ancients. It downloaded the alien language and database into O'Neill's brain. As a result, his brain began operating at over 90% capacity, as opposed to the typical 5 to 10%. He wrote a formula in base8 math for calculating planetary distance, drew a schematic with instructions for repairing the DHD, and entered new programming into the main computer to identify new stargates not known on the Abydos cartouche. You've got to bend your cozars. Apparently I have lost the fallatus to speak properly. I'm just looking at it and the words pop right into my fron. No, not yet! I'm not feggus! The Ancients created the stargate system in much the same way the Romans were taught to build roads by the gods known as 'the ancient ones'. Planet P9Q-281, one of the addresses entered by O'Neill, has a pedestal near the gate with symbols matching the language of the Ancients. Major Castleman joined the SG-1 mission there and found no indigenous life, and two suns, causing temperatures to rise above 200 degrees during the day. O'Neill constructed an energy device to provide ten times the power to the stargate, allowing it to dial an address using 8 chevrons. The 8th chevron may act as a distance calculation similar to an area code, allowing the wormhole to extend beyond the known stargate system outside the galaxy. There was once an alliance that was built over many millennia, of four great races of the galaxy: the Asgard, the Nox, the Furlings, and the Ancients. The Ancients, the builders of the stargates, moved on from this region of space long ago. The Asgards have studied the human race very closely.